Common Sense was a phenomenon in the American colonies. While only a small political pamphlet, it helped change public opinion pave the way for independence more than almost any document of the period. Published January 9, 1776, it sold over 500,000 copies and effectively changed the flavor of public from that of frustrated and angry British colonists, to independent minded Americans, seeking their freedom from an oppressing foreign power. The publication of Common Sense is clearly one of the most important events of the Revolution. Why was Thomas Paine’s call for independence so influential? What was it about that 47-page pamphlet that could turn the heads of an entire region in an entirely new direction? That is a question that continues to interest people even today. It is not unreasonable to consider that perhaps part of the reason for Common Sense’s popularity lay in part, if not in the whole behind the person of its author. Common Sense was originally published anonymously, so it would be erroneous to suggest that the author’s person or his public status brought about the public acclaim that his work received, but it is undeniable that an author’s personality and essence suffused in to their work. Therefore, understanding the man of Thomas Paine may help us to see why his book was so influential on the minds of his contemporaries. Thomas Paine was born in England in Norfolk on January 29, 1737. He was the son of a poor Quaker who was a corset maker. When He was in his teens his Father could no longer afford to keep him in school, and he became his father’s apprentice. This was not, however, Paine’s idea of his destiny and he went to sea. This didn’t suit him either, so he became an excise man in Lincolnshire. After a little while of that he tried teaching in London, and then took another position as an excise man in Lewes, East Essex. After being predeceased by his first wife and separated from his second, together with several other disappointments, he became disillusioned with England and moved to American in October 1774. On settling in Philadelphia, became a journalist and wrote many articles for the Pennsylvania Magazine. It was during this time that he published his Common Sense. He had been in the colonies less than a year, but he became a well-known Revolutionary Propagandist after the pamphlet’s publication. After the war Paine was son near to financial ruin that he call in favors and lobby congress to award him for his services during the war. When he got his reward and some land, he tried his hand at invention, but he was too restless. He traveled to Europe, where he again got involved in political propaganda and wrote his book, The Rights of Man. The radical views he expressed in his book caused great alarm among the elites in England and he was forced to leave England and declared an outlaw after his departure. After this he became a French citizen and was elected to the national convention when, but became a victim of the Terror, as he was considered to be a moderate, and was locked up in the Luxembourg prison for almost a year. It was during this time that he wrote the Age of Reason, which was his rejection of the Bible and Christianity, to a position of deism and belief in science and observation. When he was finally released through the intersession of James Monroe, the American Minister. Coming back to America, he found that he was no longer in favor and became more and more of an outcast until his death in 1809. One of the things that becomes clear as you look at the life of Thomas Paine is that he was never satisfied with the way things were. He was fully convinced of the equality of man and that each human being has rights. It was this steadfast and unwavering belief that drove him continually onward. This charisma, and his complete confidence in his beliefs is a major presence behind the views put forth in Common Sense. This type of writing and atmosphere naturally attracts people. In the uncertain times his audience was surrounded by, Thomas Paine’s work stood out. It promised something better. It promised justice and freedom from oppression. 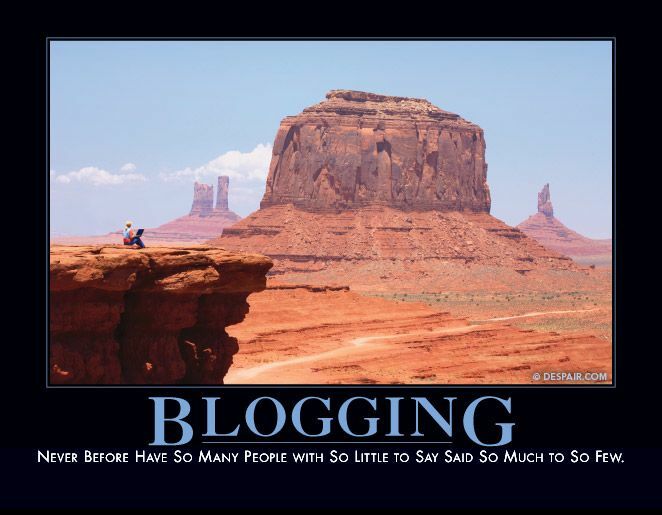 This had a significant effect on the popularity of his first significant, and widely circulated publication. Another reason why Common Sense received so wide a circulation was the style in which it was written. Thomas Paine understood that it was not the educated elites of society that caused a Revolution to be successful. It was the populace, the everyday rank and file of the colonies. Armed with this knowledge, he proceeded to write a masterpiece. Common Sense was written the common person. It lived up to its name. His goal was to present the material and arguments in as intuitive and natural way as possible so that all could understand. This simplicity, however, did nothing to diminish the force of his arguments. Common Sense is essentially a series of extended syllogisms. The logical flow of his arguments would give him credibility with the most educated audiences. It is clear that the reason for the success of Thomas Paine’s political pamphlet, Common Sense cannot be attributed to just one factor. It was one of those phenomenon, sometimes seen in history where the writer with the right message and the right style with the personality and personal drive that speaks to the hearts of common people produces a work at just he right time in history, and changes the world. Thomas Pain himself had a great deal to do with its success. His ability to synthesis powerful arguments with the intuition of his intended audience, together with his own force of character, played a significant role. The ultimate success of Common Sense, however, must be laid at the feet of circumstances. He wrote what the people wanted to hear, and they heard it. Well this is the second installment of my school essays that I am going to share. You probably already have an idea on what it is going to be about. It is extremely difficult to decide on a single person or event on which to write an essay from a time period that was so full of interesting and important characters and innumerable crucial moments. Among the many possibilities, a friend suggested the Marquise de Lafayette. The more I thought about it the more appealing it sounded, (although I only thought about it for a few seconds.) Lafayette stands out among the other prominent characters of the Revolution. This is because he had everything to loose and nothing to gain. In order to understand why he would be willing to take this great risk, it is necessary to get a little background information. The Marquise de Lafayette was born in September 6, 1757, at Chavaniac, France. He went to Collège du Plessis and the Versailles Academy, and after gaining military training became a second lieutenant in the Musketeers of the Guard on April 9, 1771. After his marriage he was promoted to captain in the Noailles Dragoons Regiment, where he became acquainted with the commander of the Army of the East, the Comte de Broglie. They became friends and Broglie introduced Lafayette to the Freemasons. It was through his affiliation with the Freemasons and other groups of thinkers throughout Paris that Lafayette learned to appreciate the concepts of human rights and even came to believe in the abolition of slavery. He heard about the struggle of the American colonies and their struggle with Great Britain. With his newfound convictions and a relationship with American agent Silas Deane to encourage him, he decided to accept an offer to join the American army as a major general. His family however did not approve and had him transferred to a post in London, but on his return to Paris, he was still resolved to go to America. With the help of Broglie and another friend, he left for America against the express command of King Louis XVI, and avoiding multiple efforts to detain him, he set sail in a ship he bought at his own expense. When he finally reached America, Congress grudgingly granted him a commission only after he offered to serve without pay and even then he still did not receive a unit. It was not until Washington took him as an aide-de-camp that he saw any action. This action was at the Battle of Brandywine, where he was wounded in the leg, but acquitted himself well and was noticed by Washington who recommended him for a divisional command. He was given Major General Adam Stephens division and fought under Major General Nathanael Green in New Jersey. He safeguarded Washington’s command, alerting him to Brigadier General Thomas Conway’s attempts to have him removed. He made an alliance with the Oneida Indians, and then returned to Valley Forge in time to lead a reconnaissance in force to ascertain British intentions around Philadelphia. During this operation he proved his military prowess by successfully extracting his force in the face of 2:1 odds at the Battle of Barren Hill. After the Battle of Monmouth Lafayette rushed to Boston to smooth things over after public rioting broke out when the French fleet left off supporting operations in Rhode Island to return to Boston to refit. The Americans viewed the Admiral’s actions as not fulfilling the alliance, and so Lafayette asked for permission to return to France. After returning to France he was briefly imprisoned for his earlier disobedience to the King, but afterwards was able to successfully lobby with Benjamin Franklin for an additional 6000 French troops. After returning to America in 1781 he was engaged in operations against the traitor Benedict Arnold and was also observing the army lead by Major General Cornwallis. He operated in this theater until the Siege of Yorktown in and the surrender of Cornwallis. After the war he returned to France. There is no doubt Lafayette contributed significantly to the American war effort in many ways. His many military successes aided Washington in his campaigns and on multiple occasions his ingenuity as a tactician shone forth. His forces were nearly trapped by superior forces on several occasions and only by his quick and brilliant intervention was he able to extract them. (The battles of Brandywine, Barren Hill, and Green Spring.) His loyalty to Washington was able to head off the infamous attempts to undermine the best commander available for the American forces. His contributions to the revolution were both significant and varied. Among the most notable, was his influence on France’s renewed support of the war with men and supplies together with his assistance in coordinating the fleet and land forces at the siege of Yorktown. 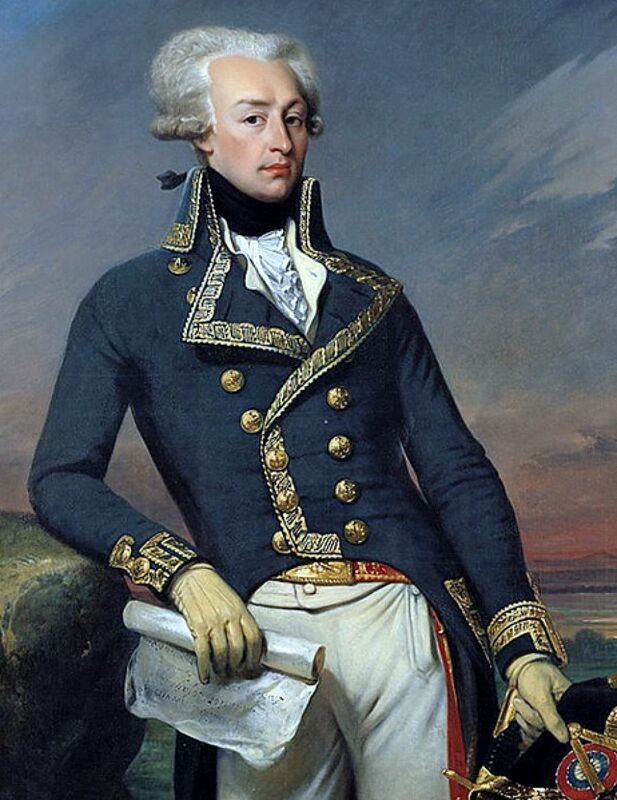 During the war, Lafayette did much to further the cause of the Revolution both in France and in the colonies. The question remains, why? As mentioned before, he had everything to loose and nothing to gain. He used his own personal fortune and abilities to aide in an endeavor that was at best unlikely to succeed, or at worst, nearly impossible. He committed himself totally to the war effort with no real chance of gain and before there were any appreciable signs of events turning in the favor of the continentals. He came to America, at his own expense and peril, deliberately disobeying the King. Why? The answer is because he was a visionary. Like the Founding Fathers, he believed there was a better way of life. He believed in ideals and was willing to lay down everything for them, even without reward. All of Lafayette’s successes on the field of battle; all his influence in the working alliance with France; and all of the personal funds he devoted to the revolution affected the outcome of the war strongly and in many ways, but the thing that the Marquise de Lafayette shared with the founders that made the most profound effect upon the Revolution was vision. He believed in an ideal, and he was willing to lay down everything to gain it, and that, to gain it for others even if not for himself. That is the legacy of the Marquise de Lafayette. 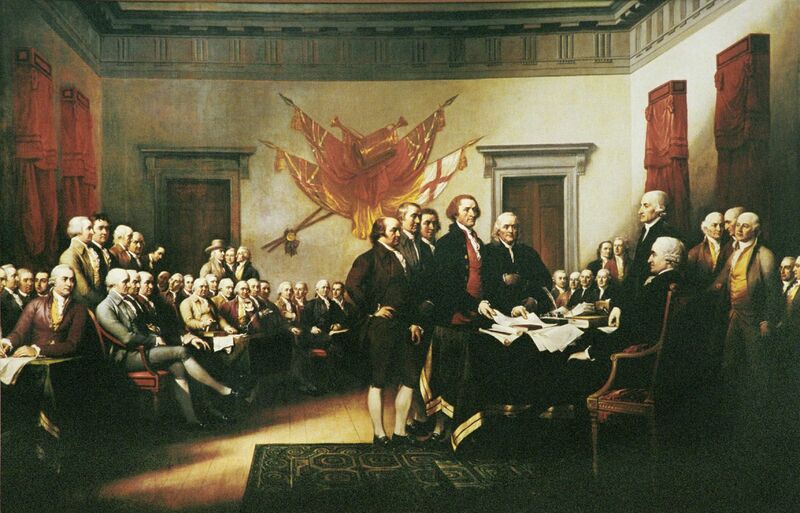 When trying to understand the motivation of the signers of the Declaration of Independence it is important to look at the events that preceded what appears to be such a radical and life changing if not life threatening leap. By doing this we are putting ourselves “in their shoes” so to speak and can view the circumstances leading them to this momentous decision as objectively as possible. To that end I turn towards the beginning of what may be the end of Britain’s control on the American colonies. That event is ironically enough, a victorious British colonial war with France known as the Seven Years War in England, or the French and Indian war in the colonies. While this war was a complete success for the British, it was extremely expensive. It was because of this war that the Crown, now desperately in need of funds, turned to what became known collectively throughout the colonies, but particularly New England as the Intolerable Acts. These were taxes on common household items, such as sugar, tea, and printed-paper. (The Sugar Act of 1764, the Stamp Act of 1765, and the Tea Act of 1772.) These various new tax measures were all designed to help recoup the funds from the war and then support the remaining troops left in the colonial frontier. The colonists resisted the new taxes and this caused the crown to bring the soldiers into the various urban centers, primarily Boston, in an effort to enforce the implementation of the new taxes. From this point onward the colonial relationship with England went down hill, being helped on its downward slide by the new Quartering Act of 1765. In the mind of the colonists, this was complete disregard for their rights as British citizens. Dissention was growing in the northern colonies and by 1770 the British governor of Boston felt something must be done to prevent the possibility of an armed uprising. He ordered the British Garrison to march to the local militias armories at Lexington and Concord. This action turned out to be the “straw that broke the camel’s back,” and the colonists retaliated. In what became a running battle the British regulars were forced back to Boston and the local militia took up positions outside the city in ever growing numbers. The siege of Boston ended with a British withdrawal to Canada, and the Revolution, as we know it had begun. It is clear that while the colonists did not take this leap lightly, their foundational rights were being ignored and trodden upon by the sovereign. Another item worthy of consideration is that while when the first shots of the revolution were fired, there was no real widespread intention towards independence. The colonists were protecting their rights; they were fighting what they viewed as tyranny. They considered themselves, and wanted to be considered as, citizens, not subjects. The cry in the early 1770’s was “No taxation without representation.” It was not “Independence and Revolution.” In Snow and Drew’s book, From Lexington to Baghdad and Beyond, they say, “… In August 1775, four months after the initial battles, The congress instead sent the so-called Olive Branch petition to King George III asking him to intervene on the colonials’ behalf to protect them from the “tyrannies” (represented by the Intolerable Acts) of Parliament… It is at least arguable that had the King responded favorably to the Continental Congress’s request, the Revolution would have either died or become a small isolated movement.” (Pg. 33) It was not until after the British withdrawal from Boston and the blatant unwillingness of King George III to grant them their civil liberties, that the decision to declare independence was made. Finally, even after the issuance of the Declaration of Independence, there is room to doubt whether a concerted effort at reconciliation on the part of the King and Parliament would have been unfruitful in reconciling the colonies. Once again in Snow and Drew’s book they say, “…The Declaration, as an ideological statement, was a comparatively mild document that had as its basic features statements of grievances directed at violations of rights by the king and the assertion of largely commercial, mercantile rights. Once again, had the British monarchy embraced those principles and agreed that the colonials were entitled to them, it is questionable whether broad based support for the objective [independence] would have been forthcoming.” (Pg. 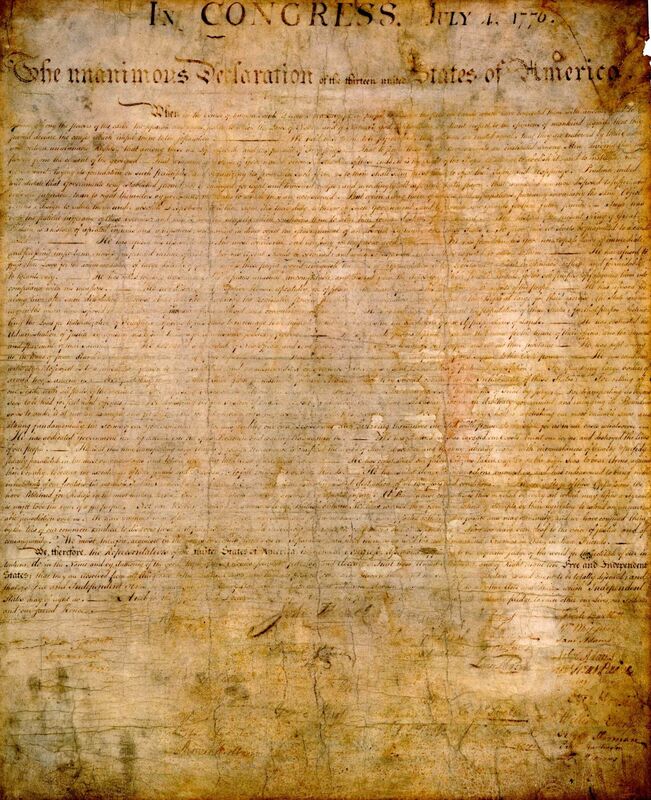 33) The Declaration of Independence was an ultimatum. In essence it laid out what the colonists considered to be their rights and what they were rebelling against.